1981 ... Alberto Garcia-Diaz [and four others] · This volume contains the user instructions for program RENU. 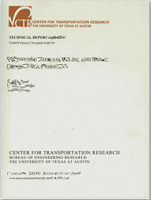 The program provides a methodology for determining the effects of changes in truck size, weight, and configuration on pavement performance and for relating these effects to pavement maintenance and rehabilitation needs and costs. 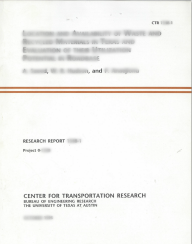 1983 ... C. Michael Walton and Chien-pei Yu · The primary purpose of Report 241-6F was to study and discuss the economic impact on the state of Texas made by the movement of oversize-overweight trucks on the state's highways. 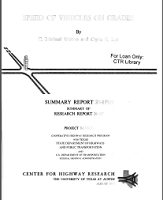 A 100 percent compliance case was set up in order to provide comparison with actual case data. · Publ.